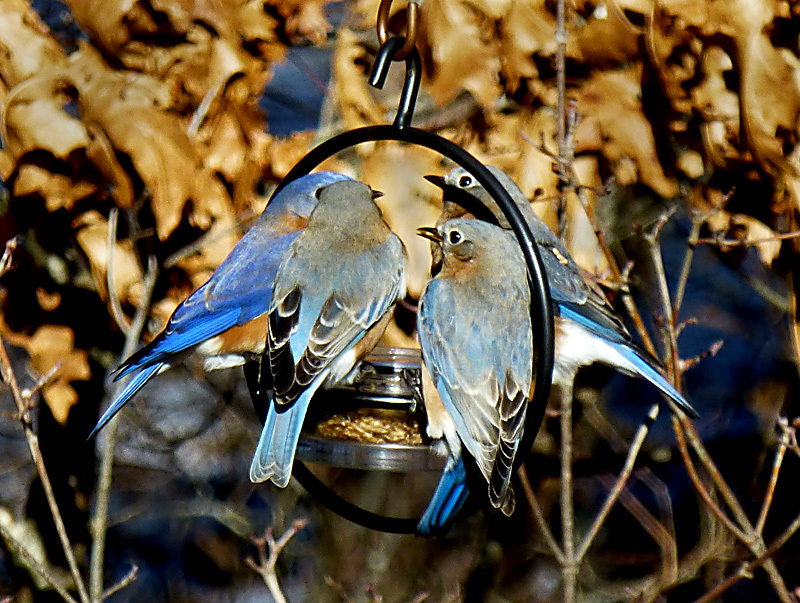 Full House At Our Bluebird Feeders On Cape Cod. It was so cold last week that the Bluebirds, and all of the other birds in our yard, couldn’t get enough to eat. 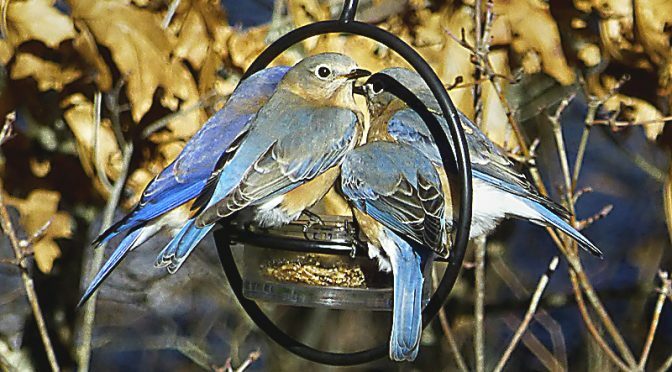 I was filling our Bluebird mealworm feeders 3 times a day. I loved this photograph with the 4 Bluebirds chowing down while 3 others sat on top patiently waiting their turn. Previous PostGorgeous Views From Marconi Wireless Station In Wellfleet On Cape Cod.Next PostThe Dunes On Pamet Trail In Truro On Cape Cod Are Spectacular! Looks like the Tulin Resort and Spa with Bountiful Buffet will have to build an addition to its facilities! These little guys are so very beautiful! Thanks, Linda! We love having them here! So much fun! It looks as if yours has a double ring, but they may just be a shadow. Also, do other birds, besides the bluebirds (and squirrels) go after the meal worms? Thanks. PS Amazon has the best price for a 5 lb bag of dried mealworms. yes, please post a pic of your custom feeder, as I’d like to avoid, as much as possible, other birds/critters intruding. Thanks! Also, is there a preference of dried vs. live mealworms for bluebirds? They keep all the critters away… squirrels raccoons, etc. I’ve always used the dry mealworms, so I don’t know about live ones. I’ll post a photo of the custom one soon.